Msomi TTC, the only private teachers college in Migori town was on Thursday closed down indefinitely as students demanded a governor aspirant in 2022 back to the helm. It took police armed with teargas canisters and guns to rein in students who demanded Bishop John Okinda, who is said to be planning for Migori governor position back at the institution. Police had to give the over 200 students 15 minutes to vacate the compound owned by Pefa Church. 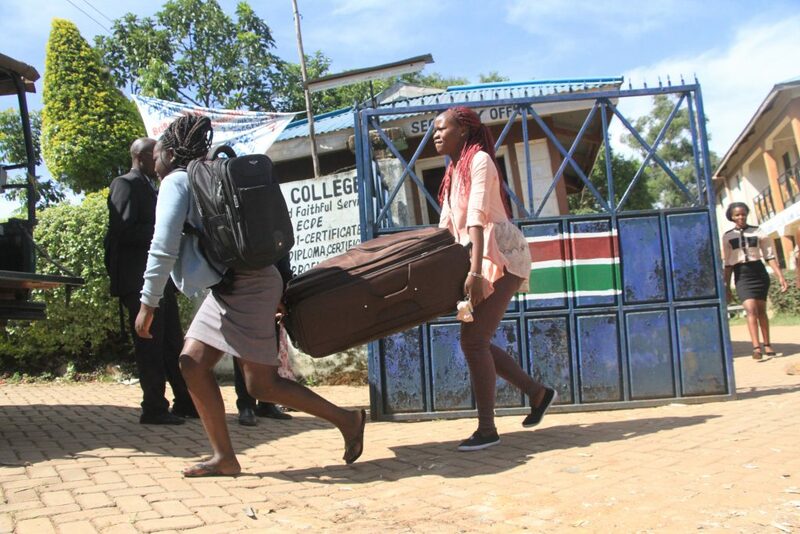 “Their problems started from inter-college games in Kisii county, we were denied chances because we did not meet some criteria,” the private institution’s principal Isaac Otieno said. Otieno said trouble started when student came from a ball game tournament in Kisii county where they were denied chance to participate. They placed on the gate banner reading ‘No Okinda, No Msomi’ and disrupted operation at Msomi Academy, Migori County Public Service Board and county Teacher Service Commission offices which are housed in the same compound. The rowdy student threw stones to journalist who tried to cover the rampage. The principal said the college bus and other property were destroyed. Okinda is yet to comment on the issue.